IB Environmental Systems and Societiesis a two-year science course that provides students with a coherent perspective on the environment. Our emphasis will be on the scientific details of our local environment with fieldwork and class lab time for hands-on experiences. However, the course is trans-disciplinary that satisfies both groups 3 and 4; students will draw on concepts from the natural sciences and apply this scientific understanding to political and social issues. Students will be expected to use what they know to establish positions on public policy, to consider diverse environmental perspectives, and to appreciate the international nature of resolving major environmental issues. Lifelong Learners – Student master’s new knowledge and skills efficiently and confidently using a variety of techniques. Analytical and Creative Thinkers – Student actively listens, critically analyzes, and responds appropriately in a range of circumstances. Investigators and Problem Solvers – Student applies basic scientific skills and concepts to understand the natural world and to develop solutions to problems. The course will cover the IB Environmental Systems and Societies standards, provided in detail to the students and are available online at: ibo.org. We will be an anti-racist, anti-sexist, anti-homophobic, multicultural class. We are against the use of words that put down students with physical, mental, or emotional disabilities. This means that everyone is an equal member of the class, and we will treat each person with respect. We will respect the physical environment of the classroom, keeping it clean and orderly. We will respect the outside environment in which we work. We are all equal as learners. Therefore, one person speaks at a time. Everyone else respects that person through active listening. We will arrive to class on time. This means you will be in your seat with your materials out and prepared to work when class begins. Everyone will actively participate in class activities, including discussions, asking and answering questions, small group work, individual work, etc. We will remove all headgear (including hats, beanies, and hoods) inside the classroom. All grooming will be done outside of class. Water is the only form of food or drink allowed during class. This means no gum! Seen or heard cell phones, electronic games, or audio/visual equipment or other electronic devices that is used inappropriately will be confiscated. Your grades will include performance on lab assignments, projects, homework, tests and your active in-class participation. We will assemble a portfolio of work to submit to IB, which will determine your IB score along with your final external assessment. We will go into more detail about this as the year progresses. Instructional strategies such as graphic organizers, think-pair-share, brainstorming, comprehension checks, and sentence starters will all be used to help reach all student learning needs. Fieldwork and labs will be a regular part of our class. You will be expected to participate in periodic field studies away from campus; I expect that you inform your other teachers and remain accountable for the assignments you miss. Internal Assessments (IAs) and major projects must be turned in on the due date. NO late assessments will be accepted; No exceptions. In order to pass the class, you must submit all Internal Assessments (labs). IAs are submitted via Managebac and are due midnight (0:00 hours) the day it is due. Late homework assignments will not be accepted. You will receive one Hyena Ate My Assignment pass/semester to use for full credit on a late homework/class work assignment and must be turned in by the end of that unit. Students must complete all of the IB Internal Assessments in order to receive a passing grade in the class. -	You can use the following as a guide to help determine any percentage grades into a Level. Grades and assignments will be posted regularly on Managebac. Please make sure you check it regularly! Finally, please come speak to me about any concerns you have about the class. Email is the best way for your or your parents/guardians to reach me outside of school hours. This course will challenge you, but I am here to help! Please come and see me whenever you have questions. Practical work is an important aspect of the ESS course, whether in the laboratory, classroom, or out in the field. The syllabus not only directly requires the use of field techniques, but many components can only be covered effectively through this approach. Practical work in ESS is an opportunity for you to gain and develop skills and techniques beyond the requirements of the assessment model and should be fully integrated with the teaching of the course. No experiments involving other people will be undertaken without their written consent and their understanding of the nature of the experiment. No experiment will be undertaken that inflicts pain on, or causes distress to, humans or live animals. No experiment or fieldwork will be undertaken that damages the environment. Passing calculators during a test, quiz, or other assessment. Copying someone else’s test, quiz, homework, assignment, or report. Letting someone copy from a test, quiz, homework, assignment, or report. Looking at notes during a test, quiz, or other assessment. Sharing questions from a test with students who have yet to take the test. Listing someone else’s data with out giving credit, or worse, making up data to fit the expected answer. It is acceptable to present your own data, to state the reasons that you feel the results should be disregarded, and then to present another student’s data (making sure the source is acknowledged). Using opinions, facts, ideas, charts, data and direct quotes from research papers, newspapers, magazines, textbooks, websites, or another person without citing the source. It is assumed that BMIS students are honorable people. 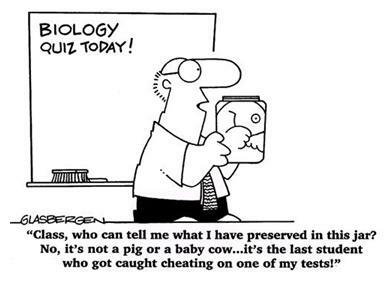 Only those lacking in intelligence believe that cheating on academic work is profitable. Students are here to learn; cheating makes learning impossible.